Filled with lots of love & little Kenye-isms, page 4 titled BE LEERY OF THE FREE GIFT BAG! Which I found most blog worthy. Kudos on the SWAG book, after reading it I felt as if I had "just a little" inside to Kenye the mystery man. Very methodically written and somewhat personal in his mini messages of inspiration to his fans. The bigger picture from a advertising and marketing stand point is I love my Kenye keepsake and will continue to be a loyal fan. After all he cares enough to invest his money and thoughts in making such a clever little gift for me, his fan, why wouldn't I! It's my opinion that's why Kenye West is so successful, he is marketable on every level to all genre's of music lovers. A Fashion Studio's logo has to be as"Couture" as the Super Models that grace it's cat walk. Soul works with some of the most notable international photographers, Art Streiber, Brian Bowen Smith, Mark Liddell, Marc Baptiste and Matthew Rolston. "Shoot With Soul" designed a trend setting logo. Graphics of this level can easily be seen at high-end retailers like Bloomingdale's and Saks. It's no wonder the VIP celebrities, producers and celeb photographers are happy to sport "Souls SIGNATURE SWAG." These American Apparel Shirts were "of course" sourced and screened by yours truly. If your looking to book a location for your photo shoot, fashion show or event visit http://www.soulstudios.com/ for a truly luxe experience. -"Be a trendsetter and design your logo with SOUL." "GUESS Inc. Celebrates Earth Day 2008"
I'm happy to report Earth Day was celebrated across Los Angeles with some fabulous events. Guess Jeans celebrated it's first ever Earth Day Fair where they brought in local vendors for "Fresh Produce" & "Fresh Flowers". During lunch Guess staff shopped the delectable variety of veggies and fruits while enjoying their lunch breaks. Guess Inc. is so inspired to create awareness, they unveiled their new signature "GUESS ECO BAG", a non woven re-usable shopping bag. In true Guess style, the ECO bag was graced with the signature Guess Triangle logo and decorated with fashionable "recycled grommets." I can easily say that "GREEN IS THE NEW BLACK!" In case you're wondering the bag is not available at retail ;-( . When asked what the feedback from the event was...."It was so great- the employees really loved it, and they want another one soon. 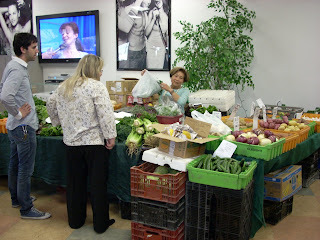 I think now due to the response we will have a regular monthly farmers market beginning next month." - JC Nerio, Guess? Inc. -Bravo Guess! 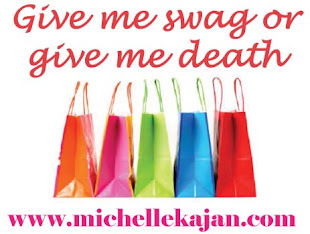 Most LA Swag blogs are about... "What's the hot glam product being given out at the gift suites this season????" Branded SWAG plays an important role in marketing today. This blog pays respect to marketing professionals and the companies they work for that spend countless hours, money and research to market their brands. I can't say who the client is but "Coachella Festival 2008" is right around the corner and lets just say the gift bags are ECO-Inspired. Being Green is the "HAUTE" ticket in this town, and it's here to stay. Celeb's know how to "BRING IT" and are notorious for serving causes as should their SWAG !! It ain't your hippie-mama's ugly old recycled freebie's from the 70's. Environmentally friendly product has taken a turn for the pages of "In Style". Eco-product is cooler then ever. There are several ways to be Green with your promo’s. Like ditching those Styrofoam cups and inspiring your office to BRING BACK THE OLD CERAMIC MUG. 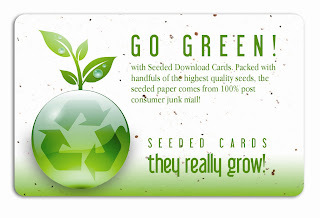 Or how about a “rocking download card”, you can download the hot tunes, ring tones or movie tickets then toss it to your garden and grow flowers out of it.